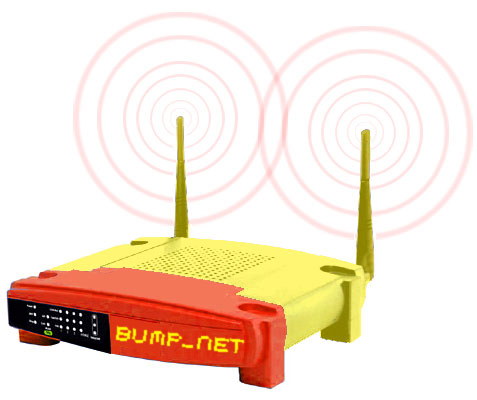 BUMP_NET – 2005 | JONAH BRUCKER-COHEN, PH.D. BUMP_NET – 2005 – JONAH BRUCKER-COHEN, PH.D.
BumpNet is a wireless network that challenges the existing methods of connectivity among multiple clients to one wireless base station. The project consists of a public wireless network that only supports a maximum number of connected clients. When a new person joins the network, the first person on the queue is “bumped” or dissallowed access to the connection and network. Like its predecessor, BumpList (an email community built around the same principles), the focus of the project is to determine if by attaching simple rules to communication infrastructures, the method and manner of connectivity and behaviors of people connecting will change over time. 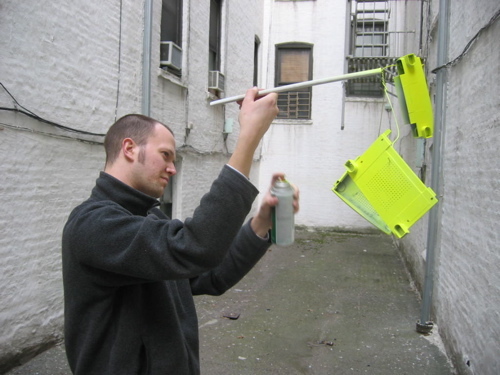 “BumpNet social experimentation through frustration”, Engadget, 6/18/05. “A Wireless Network for the Determined”, WMMNA, 6/16/05. “A Wireless Network for the Determined”, Networked Performance, 6/16/05. The phenomenon of wireless connectivity between computers, the Internet, and other mobile devices, is reaching virtual ubiquity. Most portable electronic devices have built in wireless capabilities with the functionality to support multiple networking protocols. Despite the technology being available, the socialization of how people use and experience these devices is still developing. 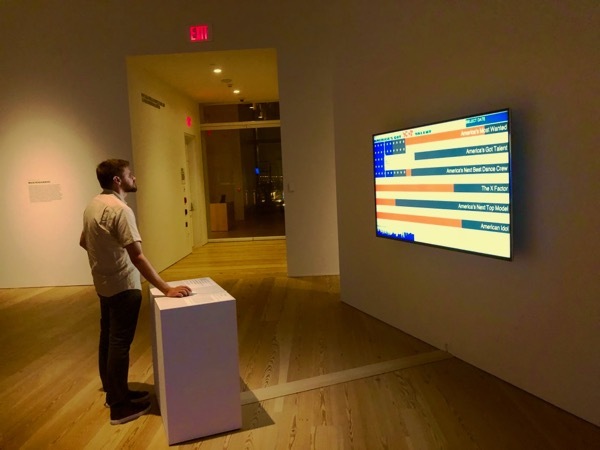 BumpNet is meant to accentuate the social atmosphere and contexts of where this connectivity occurs by creating a “spatial” and “time-based” connection model. Not only will users who arrive within network range first gain access, but they will also lose this access as the space gains saturation with other people and devices wanting to connect. Thus the more people connected to “BumpNet”, the less access each of them will have and they will have to compete for “airtime” by rejoining the network. This is meant to accentuate the subtleties of public interaction with an increasingly technological social atmosphere. 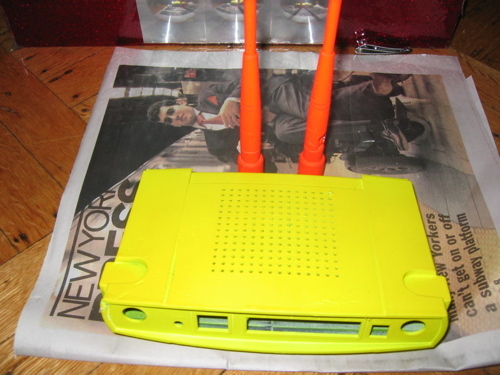 The BumpNet system involved rewriting the existing firmware of an off the shelf wireless router. A consumer model was chosen for its ubiquity in the marketplace and the availability to gain access to its sourcecode. When turned on, the router works the same as any other router: A client will see the name of the network and be asked to join. Once joined, the client is taken to a portal page when they open their browser that shows the name of the person and mac address of the machine they bumped. There is a login screen, where the new user is asked for their name to continue with the connection. Once they have entered their name, they click “Submit” and are then connected to the Internet. They can then use the connection normally as they would any other router. When they are “bumped” from the network… when they try to visit a website they will see the BumpNet portal page and a message explaining that they were “bumped” from the network. To re-connect, they must attempt re-connection through their wireless card’s software interface. Once bumped, they will have to wait a specified amount of time before they can re-connect to the Internet.